Singapore will be hosting a six-nation international netball competition called the Fisher & Paykel Nations Cup from 31 August to 6 Sept. The tournament will be Singapore’s most competitive tournament since the Republic finished 15th at last year’s World Championships. Singapore, which won the 4-Nations and 5-Nations competitons in 2006 and 2007, will be taking on Samoa (world no 6), Sri Lanka, Botswana (10th), Northern Ireland and Papua New Guinea (14th) in this year’s competition. This competition was reported not just in redsports but also in The Straits Times and TODAY. However, all of them issed what I felt was one of the most significant newspoints. If you look at the make-up of the provisional national squad at Netball Singapore’s website ( see link ), you will notice that a 17-year-old and two 16-year-olds – Suhailah Kariman ( Wing Attack, Centre ), Melody Teo ( Goal Defence/Goal Keeper ) and Povaneswari d/o Shanmugam ( Goal Defence/Goal Keeper ) respectively – have also been drafted into the team. Not only are they the youngest players in the squad (the second youngest seems to be Anna Soo at 19, while the rest are between ages 23 to 29 ), they are also either Singapore Sports School students or graduates. All of them were part of the pioneer batch of students who joined the Sports School when it opened in 2004, and part of the 12 students who formed the Netball Academy at the School. If I’m not mistaken, Suhailah is now in a top junior college after aceing her O levels last year while Melody and Povaneswari are Secondary Five students this year. Even if they do not make the final Nations Cup cut on 5 Aug, I think their selection for the national open squad still marks a significant milestone for the Sports School. I must admit being really sceptical when I first heard, back in 2003, that the Sports School was including netball as one of its eight core sports. Why netball, I wondered. Sure, it may be the most popular girls sport in Singapore, but I had often wondered what was the point of including netball when there is no professional playing career path for the girls after leaving the Sports School. I mean, Netball Singapore’s Super League is strictly amateur and lasts only a couple of months each year. And even world netball powerhouse Australia doesn’t have a professional league. In fact, Netball Australia has, according to its website, a tie-up with global employment agency Adecco, to help provide its elite players with workplace development and employment opportunites. In contrast, one can see why the School started a Football Academy – after all, there are possible future professional playing opportunities for the student trainees in Singapore’s domestic S-League. What’s more, the netball students are only given the option of going to the polytechnic or junior college after completing their O levels at the Sports School. In other words, not only will they be returning to the mainstream education pathway, they will also no longer enjoy the Sports School’s flexible academic curriculum which had enabled them to grow and develop as players. But the inclusion of Suhailah, Melody and Povaneswari has now caused me to look at the Sports School’s Netball Academy in a new light. I mean, look at it this way: if this was the announcement of the Lions’ World Cup squad instead, you can be sure there would be a huge media buzz over the inclusion of two 16-year-olds and a 17-year-old into the squad. When was the last time you heard of a 16-year-old being included in the senior Lions squad? I can only think of one – Harris Harun, who made his international debut for Singapore in the Lions’ 2-1 win over North Korea in June last year. Even national skipper and striker Indra Sahdan – once touted as Fandi Ahmad’s successor, only made his national team debut when he was 18 – in Singapore’s 0-4 loss to Kuwait in a 1997 World Cup qualifying match. Three national squad members out of a pioneer batch of 12 students – that’s effectively 25 percent of the number of Sports School netball trainees going on to represent the Republic at senior level. Hey, that’s not a bad return at all on investment. What this means is that the Sports School is effectively helping Netball Singapore to raise the bar in playing standards by producing a stream of young athletes who are not only better players than most of their peers but who are also able to compete against older, adult players. This can only augur well for the national team as it seeks to improve on its world ranking and break into the top-10 eventually. I guess the main challenge now for Netball Singapore is to find ways to ensure that this growing pool of young Sports School graduates do not slip in their playing standards or drop out of the game once they are back on the mainstream educational path because of school pressures. Maybe this is where Netball Singapore can take a leaf from Netball Australia’s book, and seek corporate partners who can help to provide further education, career development or employment opportunities for these young women once they leave the Sports School. A start could be to get these young promising athletes enrolled into the Auckland University of technology’s sports diploma programme which is currently being hosted at the Sports School so that they can continue to study and train under the type of flexible academic curriculum that they have been used too since Secondary One. I hear that Netball – and Football Academy – trainees are not eligible for Sports School scholarships to enrol into the diploma programme. So perhaps NS may want to look for a corporate partner ( Fisher & Paykel? ) to provide similar scholarships for these girls so that they can be part of this diploma programme. The ball, as they say, is in Netball Singapore’s court. In the meantime, the Singapore Sports Fan congratulates Suhailah, Melody and Povaneswari on their inclusion into the national provisional squad and hopes that they can make the final cut for the Nations Cup. P.S: Picture taken from Netball Singapore’s website. Povaneswari is second from left on the top row while Suhailah is thrid from left in the bottom row. Melody is on the right of the second row. Singapore’s junior paddlers plundered five golds, two silvers and a bronze at the 14th Milo South-east Asian Junior Championships in Kuala Lumpur, last week, to underline their status as the region’s kingpins in the sport at youth level. Sylvia Look was the Republic’s biggest individual winner in the annual eight-nation competition with three golds. The 15-year-old student captured the Girls’ Team title along with Zena Sim, Isabelle Li Sandra Goh, Kwa Hui Qi and Lu Chun Qi, ahead of Thailand and Malaysia. She also defeated Isabelle Li 4-2 in an all-Singapore Girls U-15 singles final to take the individual crowd. Sylvia completed her hat-trick of golds when she and Isabelle defeated their Malaysian opponents, Liew Yong Xuan and Lim Ann Er, 3-1 in the Girls U-15 Doubles final. Former Asian U-15 singles champion and Commonwealth Games gold medallist Zena Sim also had a good individual outing in Kuala Lumpur. The 18-year-old Singapore Sports School graduate, who is now pursuing a diploma in sports science and exercise management at the Auckland University of Technology, defeated compatriot Hui Qi 4-0 to take the Girls U-18 singles crown. However, the duo could not add the Girls U-18 Doubles title to their collection as they went down 1-3 to Malaysia’s Ting Hie Phin and Gam Giak Ping. Interestingly, Zena’s results were the exact opposite of her fortunes at last year’s Championships in Laos. Back then, she had finished second in the Girls U-18 singles and took the gold in the Girls U-18 Doubles. Singapore Sports School student Pang Xue Jie also experienced the same reversal of fortunes. The 15-year-old student, who was part of the national men’s team that won the team title at last year’s SEA Games, whipped his Vietnamese opponent, Le Tien Duct, 4-1 to take the Boys U-15 singles title (he finished second in the same event last year). But Xue Jie lost the Boys’ U-15 Doubles gold which he won last year. This time, he and team-mate Darren Chong fought valiantly but were edged out 2-3 by Le Tien Dat and Nguyen Ngo Tu of Vietnam in the final. Singapore won its sole bronze in the Boys Team event. The Boys team was made up of Xue Jie, Goh Yi Long, Darren, Lim Jie Yan, Benjamin Teo and Bob Teo. Vietname won the gold followed by Indonesia. Zena and her team-mates, Xue Jie and Darren, will now represent South-east Asia at the Junior Asia Championships which will be held in Singapore from 23-27 July. Just thought I’d let you know: this report was painstakingly compiled from a number of disparate sources after a search through the Singapore Table Tennis Association’s website and www.sttnews.blogspot.com, which claims to be a non-official site of the STTA, yielded nothing. That, in itself, was very disappointing, considering the fact that these are Singapore’s most promising local juniors, that they were flying the Republic’s flag in a regional competition, and finally, that they vying for the honour of representing South-east Asia at the Junior Asia Championships in July. When you are a young, aspiring athlete, one of the things you look forward to is seeing some mention of your achievements in the newspapers. I firmly believe that youth athletes should be given due recognition and publicity for their achievements because this will help to spur and motivate them to work harder and to stay in the sport. This also explains why for a few days, I kept seeing “south-east asian junior table tennis championships” and variations of it appearing as search terms on my blog. Clearly, there were youths and die-hard local table-tennis fans looking for information and results from this event. When I couldn’t find anything myself on the net, it prompted me to go to a range of sources to piece together the results in order to come up with this newsflash. When the national governing body for that sport isn’t even proactive in disemminating information about their local juniors’ achievements on the international stage, the silence is simply damning. Compare that to the way the Singapore Sailing Federation constantly updates its website and alerts the media to the latest competition results, and the gulf in standards just stands out. The Singapore Sports Fan congratulates all our junior paddlers for a great job in Kuala Lumpur. My heartiest congratulations to those paddlers too who have made the cut to represent South-east Asia at the Junior Asia Championships. Here’s wishing them a successful competition ahead. P.S: This is a personal invite to all local junior paddlers and table tennis fans out there. If you would like your achievements or results at any major international competitions to be reported on this blog, do email me at sporesportsfan@yahoo.com.sg. Send me as many details as you can ie how many medals Singapore won, who won what, by what score etc, and I will do my best to create a report out of it for this blog. I look forward to hearing from you. 26 June: Singapore Boleh, Local Talent Boleh! In “Double Joy for Liu, Cheng”( TODAY, 26 June 2008 ), it was reported that sailors Justin Liu and Sherman Cheng were still unlikely to get the nod for the Beijing Olympics despite finishing second in the 29er class at the prestigious Keil Regatta in Germany. In “Sailing gets YOG Boost” (The Straits Times, 25 June 2008 ), it was reported that Singapore’s hopes of winning medals at the 2010 Youth Olympics Games were given a huge boost after the ISAF, the world sailing body, chose the Byte CII for the one-person dinghy event and the Bic Techno 293 for windsurfing. Singapore is traditionally strong in the Byte CII. The report also quoted SingaporeSailing president Low Teo Ping and chief executive officer Andrew Sanders as predicting a two-to-three medal haul for Singapore at the YOG. Some may find him an abrasive character. Others call him arrogant. But to me, Low Teo Ping, president of SingaporeSailing, (centre of above picture, with thumbs up ) is a national hero – for championing local talent and for proving that Singapore can succeed in sports on the world stage WITHOUT having to resort to importing foreign talents. I think the successes that SingaporeSailing have achieved over the years speak for themselves. Frankly, apart from the five Asian Games golds that our sailors won at the 2006 Asiad in Doha, Qatar, the best result by any national sports association (NSA), I have lost count of the number of world youth titles that they have also won over the past four years. However, I am willing to bet that if you average the triumphs, you get a figure of about one or two world titles a year. Now that’s an amazing feat. The newspaper reports which I’ve pulled out also speak for themselves. To have Low and Andrew Sanders, his chief executive officer at SingaporeSailing, confidently targetting two to three gold medals from their sailors at the 2010 Youth Olympic Games, speaks volumes not just of the sort of self-confidence that these two men have in their young athletes but also the breadth of talent available at their disposal (See “Sailing gets YOG Boost”, The Straits Times, 25 June 2008 ). Again, to have an army of local sailors still fighting tooth and nail ( four contending pairs in the Men’s 470 selection trials, four sailors in the Laser and four in the Laser Radial) at this stage for the right to represent Singapore at the Beijing Olympics, gives you an idea of the number of talented sailors that SingaporeSailing has managed to groom over the past 10 years. Another sign of Low’s firm belief and faith in local talent: His forging of a partnership with the Singapore Sports School so as to ensure that his still-schooling sailors have a flexible academic curriculum that enables them to jet off regularly for competitions and training stints ( Note: Quite significant to see the Sports School listed as one of SingaporeSailing’s partners in success on the NSA’s website ). And ah yes, there’s also Low’s sheer willingness to invest in his youngsters, sending them all over the world to compete in international meets. In fact, Dr Irwin Seet, the Sports School’s Director of Sports, was, at one stage, known for saying out loud in jest that he could hardly remember what Victoria Chan, one of Singapore’s brighest young sailors, looked like as she seemed to spend more months away competing and training than in school. And even though sailing, as a spectator sport, will never attract the sort of crowds as say, a Lions’ football game or an international badminton or table tennis tournament, you can be sure of one thing – it has gone a long way in restoring a sense of pride not just in Singapore sport, in local talent, but most significantly, in the ordinary man on the street. How else do you explain the fact that after the 2006 Asian Games, strangers were actually going up to Low, wherever he went, to shake his hand, to congratulate him, and most significantly, to thank him for showing that “Singapore talent boleh”? Most importantly, Low, through SingaporeSailing’s successes, has effectively exposed the excuses that were used by those NSAs to justfy their rampant use of the Foreign Talent Scheme. That he has done it through a sport like sailing is even more amazing. Sailing is an extremely expensive sport. You have to own your own boat, your own sails, and you will probably have to be a member of one of the handful of sailing clubs in Singapore. Basically that means that the sport’s entry barriers for the average Joe on the street are high. Compare that to the cost of buying a badminton racquet or table-tennis bat, and to the slew of badminton courts and table-tennis tables that can be found in schools, community centres, HDB playgrounds, and evne HDB void decks! In other words, the barriers to entry for badminton and table-tennis for kids are practically non-existent. 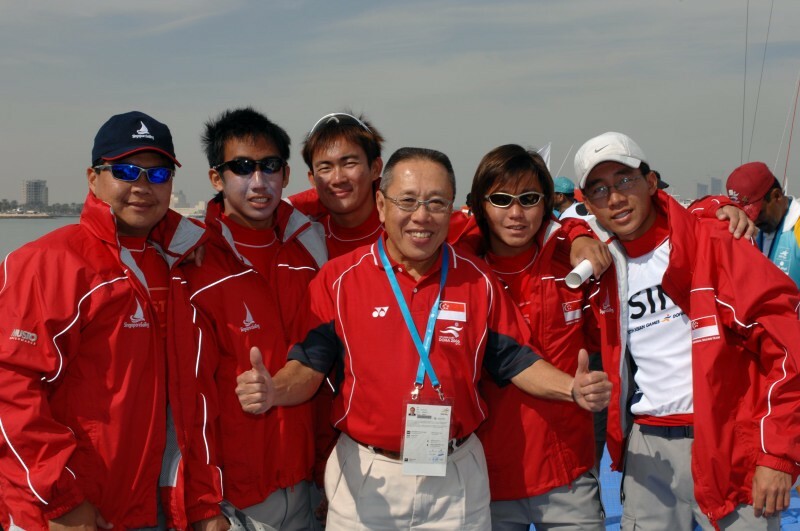 All this means that SingaporeSailing, over the years, has had a much smaller pool of talent to choose from, develop and groom than badminton and table-tennis. Yet, despite this societal obstacle, it has still managed to produce a constant stream of South-east Asian and Asian Games winners as well as a string of world youth champions. In contrast, we find the Singapore Table Tennis Association and the Singapore Badminton Association lamenting that Singapore’s population is not large enough to produce enough local talent for them to develop into world-class players, and using this as a reason to import foreign-born players into their national squads. At the end of the day, I think it’s clear that it’s not the lack of quality local talent that is preventing Singapore from producing world-class athletes. It’s the lack of quality leadership in certain NSAs. So thank you, Mr Low, for showing what Singaporeans can achieve with local talent if they set their minds to it, and thank you for restoring faith and pride in our Singapore athletes. 18 June: Singapore Table Tennis: Is there more – or less – than meets the eye?